1) It is nearly impossible to prove and totally improbable to corroborate. If I wanted to write a book and make people buy it, I think one of the things I would consider is making an accusation that fits the above description. To prove it first someone would have to come forward and admit they were complicit in this endeavor. I find that highly unlikely for two reasons. First, that person would be admitting they altered the outcome of official major league games. This would almost certainly result in banishment from baseball forever and could possibly even result in criminal prosecutions. Second, whatever player admitted to this would essentially be telling everyone that he was not good enough to hit on his own. In the modern masculine ego-driven sports world I find it difficult to imagine a player admitting this. In many ways, it is worse than admitting to steroid use. With steroids you still have to hit the ball. If you know the pitch and the location, that process gets extraordinarily simpler. 2) We would have to believe that no pitcher, bench coach, manager, or video-reviewer ever figured this out. In a league where every statistic is evaluated ten times over and used as evidence during contract negotiations, I have to imagine that any pitcher would be furious if they figured this out. So, if it did happen, we have to also believe that no pitcher on A-Rodâ€™s teams noticed that some guys were killing the ball during blowouts. We constantly hear stories of players and teams noticing differences in how pitchers hold their glove, the way catchers set up, and the way baserunners stand when they are going to steal. Teams use that information to gain an advantage, and they should. However, in that analysis, it seems likely that someone would have noticed what was going on. 3) There would have to be some way that A-Rod set up the system. Letâ€™s take this from the top. A-Rod does not play first-base, so he would not have the opportunity to talk to hitters standing on first. Plays covering second base (during his time in Seattle and Texas) would most likely not give him enough time to set the system up. Furthermore, I think we can safely assume he did not discuss this with catcher while at bat because the umpire would overhear and catchers seem the least likely to be involved in a pitch tipping scheme (most of the reports I have read do not indicate that this was catchers simply telling him the pitch). Furthermore, even if a catcher was giving A-Rod the pitches, A-Rod is not a catcher so he would still need to establish some sort of system to communicate during the catcherâ€™s at bats. So, we can reasonably assume that he did not set this system up during games. This one is simple. If A-Rod selects the wrong man to approach, the player goes nuts, gets angry, and tells everyone. This did not happen. Moreover, every guy on the other team would not be capable of helping him out. Outfielders seem incapable of seeing signs and successfully relaying them to A-Rod, and corner infielders usually have their view somewhat obscured. So, that leaves the two middle infielders as possible targets. If you take this thought to its logical conclusion, that means there were two guys (the starters) on each team that could help him out. 5) What other ridiculousness do we need to account for? Teams play 162 games a year. They play 18 games against each division opponent, making 72 of those games (52 if he did it with Texas). It would seem less likely that a division rival would do such a thing, so that would leave 90 games. Fifteen games are interleague games, which also seem unlikely, so that brings the total down to 75 games. In those 75 games (where they play another team no more than 10 times), A-Rod would have to have a player on the other team involved, be involved in a blowout, and neither player could be substituted during that blowout. He would then have to successfully get the sign from that player (or give it) in the hopes that they would return the favor. Lastly, it seems almost impossible for A-Rod to have done this in New York since he himself plays third base and most likely cannot definitively see the signs. What does all this mean? Well, I think it means that it would be VERY hard for A-Rod to have set up such a system. For it to be true we have to accept the fact that no one caught on, the offending players never told anyone, A-Rod never guessed wrong in approaching someone, and that those players trusted each other to keep their word and reciprocate. In the end, I think this makes this story nothing more than an attempt to sell a book. However, if I am wrong and this can be proven, I will be the first to say that he deserves a lifetime ban and a permanent place next to the Black Sox. love the title. 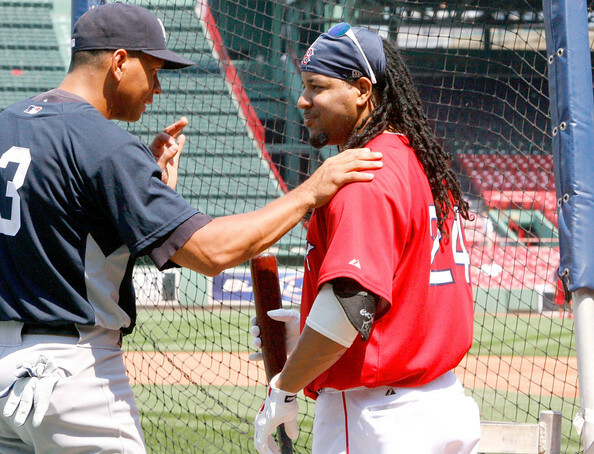 Point #3 – Arod and the other SS’s in the West were all good friends (see roid-mate Tejada), a system is easy to set up in the Winter Leagues or even by texting back and forth in the offseason. If this is true, which i agree is hard to prove or believe; they were probably BS’ing during winter ball, talked about how they could help each other out to get back on track confidence-wise and came up with what we are hearing. We figured out a pitchers signals one game in HS, and could tell the batter fastball or offspeed. While you still need to hit, it definitely helps out a lot to know what is coming. What I can’t believe is how incredibly odd it is that the picture I used and the caption I wrote work perfectly for today’s news. that’s just great journalism. Its what we strive for here at The Drubbing. The timing is unbelievable. If I hadn’t seen it with my own eyes, I would’ve called BS. It’s just too bad Manny couldn’t have hidden it and gotten caught four years later. Maybe then he could’ve gotten away with it too. What I can’t believe is that Manny is the one that got caught using a femal fertility drug. That sounds more like A-Rod than anything else.